Thanks for the the lovely svg. Thankyou this is fantastic. I am going to hold a Girls Night In to raise money for women with cancer. This will be perfect. Can't wait to have time to make this awesome purse card. Thank you so much!!! 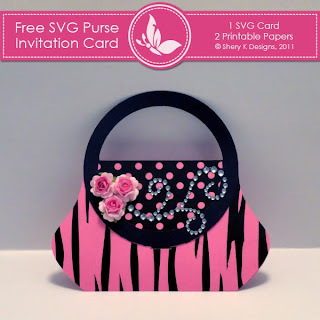 Fab purse card - thank you for sharing! Thank you for sharing. It is beautiful. Thank you for this cute file. I am making it as a birthday money holder for our granddaugther. It's so pretty and has so many possibilities for embellishments! I love it. Oh this is soooo cute! Thank you so much!